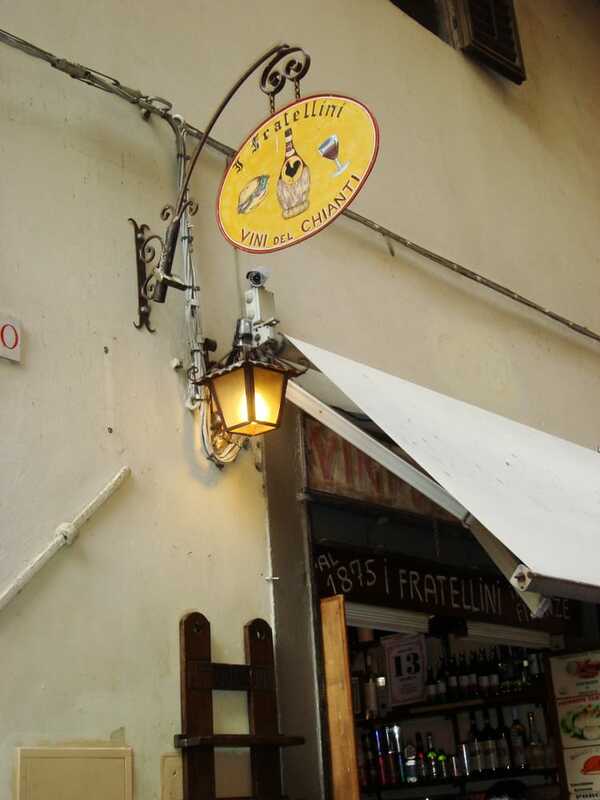 Open since 1875, I Fratellini(Little Brothers), is literally, a little hole in the wall wine and sandwich shop in the historic center of Florence. Just and opening with a bar and if you walk by it's little side street too quickly you will miss it, in fact, if there isn't a crowd of people in front of the place you can barely tell it's there. When it's closed with it's door down it is anything but amazing looking and you would never know that a delicious little panino filled world lies behind. Oh this place....there is something so romantic about it for me. I think it paints the perfect picture of the simple and delicious way Italian's do food and I love that it is small, hidden away and that the walls are busy with wine bottles and time. I love the history and that it has been there, just like that, for so so long. There are many amazing quick places to eat in Florence, but there is something different here....something that draws me back every time. Something just so Italy. It is a must stop, a must see, and a must try....again and again and again. Every sandwich starts with a crispy buttery baked to golden brown perfection roll that is oiled and warmed to bring out it's natural flavors. 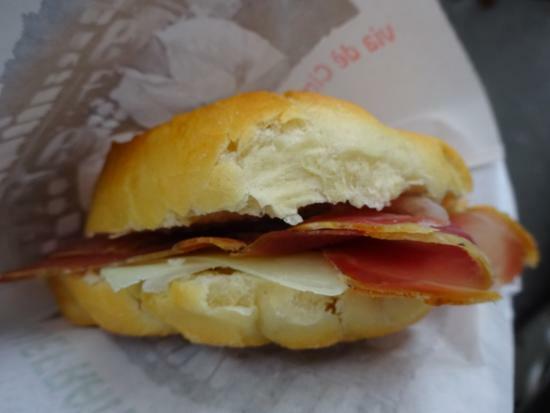 Each sandwich is then layered up with it's various meats, cheeses and veggies, all sourced from small Tuscan producers and all deliciously Italian. They have a long menu of 29 sandwiches to choose from. It can seem a bit overwhelming at first glance but the sandwiches are all fairly simple with only a few ingredients in each. I'm pretty sure you couldn't go wrong with any choice, so just pick your favorite number:) #1 is one of my favorites -Ham(prosciutto), soft goat cheese and arugula....so good! There is usually a line but it moves fast and the service is friendly. Your sandwich will be ready almost as quickly as you can order it with one brother taking orders and pouring the wine and the other putting the sandwiches together. Whether you stand or sit on the curb to enjoy your lovely little piece of Italian heaven, you can sip on wine by the glass too. When you are finished you can leave the glass on the little shelves to each side of the counter. They are open Monday thru Saturday from 9:00 - 20:00 or until the bread runs out....which I love! Their address Via dei Cimatori 38/red, 50122 Firenze, Italy. Right by the Orsanmichele Church. The cross street is Via dei Calzaiuoli. Phone 39 055 239 6096.